Query and Function Wizard - Select Table - Event 1 Software, Inc. The Table column displays the friendly name for table. The File column displays the file name stored on disk. 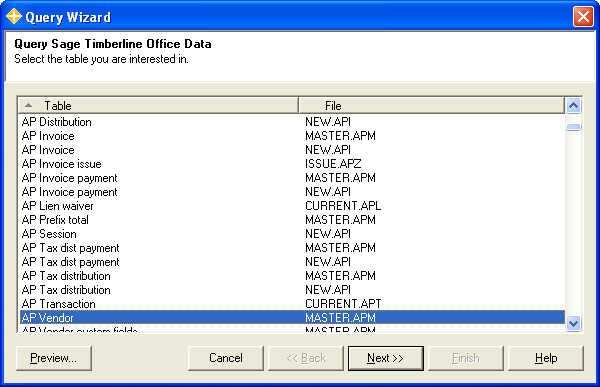 The file name is useful for selecting data in New, Current, History or named files. Click the column header to sort the list by friendly name or internal name. You can begin typing a table name to make the highlighted row jump down to that part of the list or press Ctrl-F to use the Find window. Click Preview to browse the raw data for all fields in the table. If you have selected one or more fields and returned to this screen, then the Preview button will only display data for the selected fields. Click Cancel to dismiss the dialog without inserting the query or function. Back is disabled because this is the first screen on the wizard. Click Finish to insert your query or function. Finish will be enabled as soon as the wizard has sufficient information to insert the query or function.